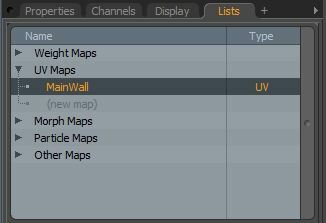 When creating UV maps the first thing you will want to do is isolate large sections or group small objects together to share a UV set. For this section, I isolated one of the walls from the solve in the walkthrough. 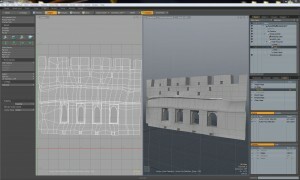 First, make sure you are working on the original UV Map, Lists > UV Maps. The default map is named “Texture,” to keep everything in order you will want to rename this to a distinctive name with the object, ex. MainWall. Making sure you have clean UVs overall will prevent texture seams when baking later on. Before we start unwrapping you will want to map a function onto a hotkey. To do this, open up your Input Editor, System > Input Editor. 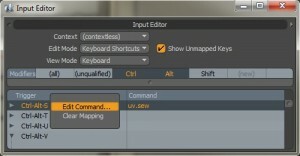 Ensure that Show Unmapped Keys is highlighted and Shift+Click the Ctrl and Alt modifiers. Now scroll down to Ctrl-Alt-S, Right click and select Edit Command… and enter in uv.sew. This will allow you to sew your points without going through any trouble. Now that you have gone through the initial steps it’s time to start unwrapping. 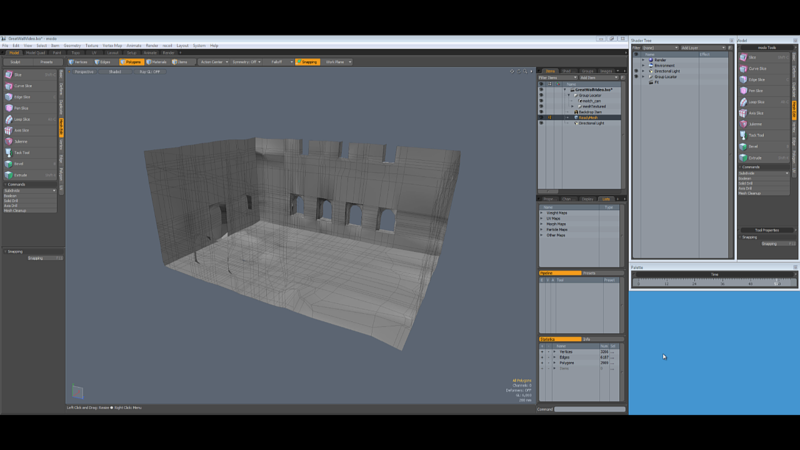 To begin, while in the UV tab select your mesh you wish to unwrap in the Items box. 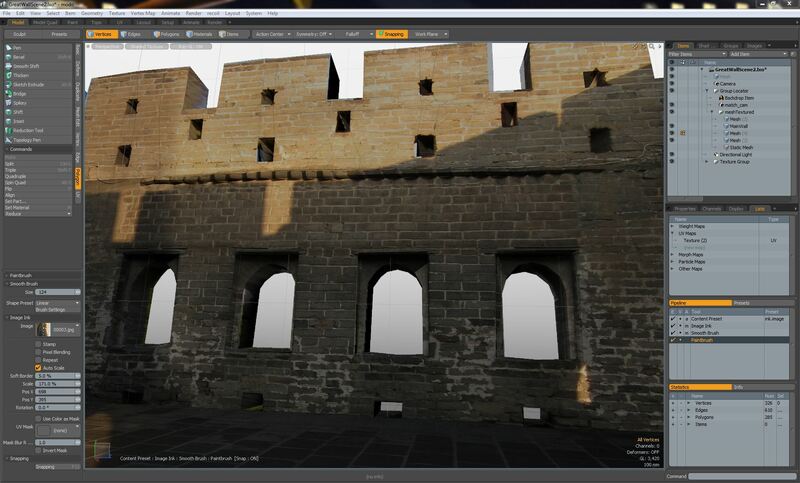 Go over to the left toolbar and select the UV Projection Tool. For a quick unwrap(usually comes out rather nicely), use the Projection Type, Atlas or Atlas 2. 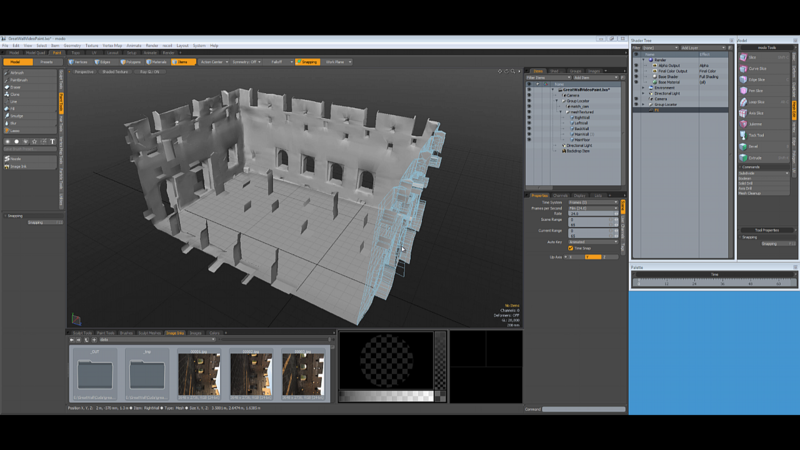 To unwrap, right click in the UV viewport and watch the mesh unwrap. If you have red overlapping sections try to use the second Projection Type and vise versa. 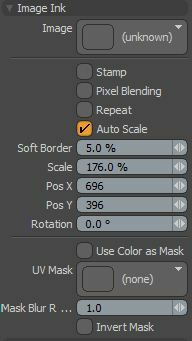 When you find that you have overlapping UVs, use your Vertices, Edges, and Polygons selections and use your Translate, Scale tools to move around points and sections to unwrap. 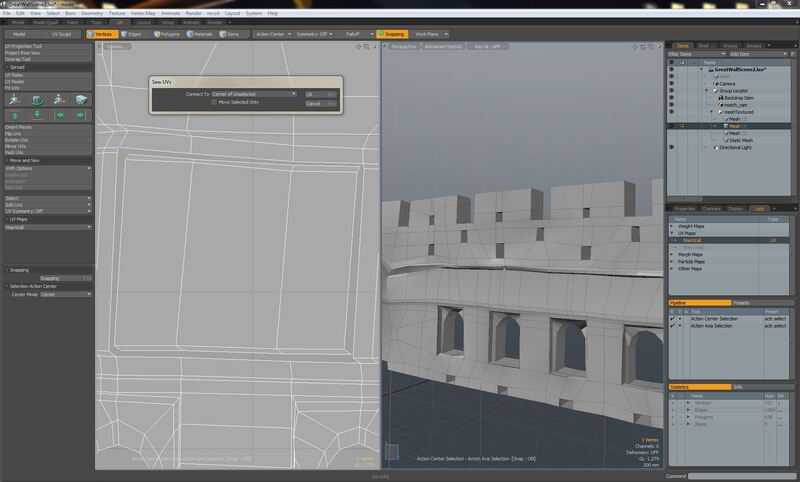 If there are missing sections within a large section of your UV set, you can relocate the separated section and sew together the vertices to fit inside the UV set. Here you will use the sew tool that was mapped. Select your first stray vertex and hit Ctrl+Alt+S and select Center of Unselected (This will always be selected for future quick use). The sew feature also works with mutli selection, meaning you can select multiple vertices, or edges and this will sew together in the correct fashion. 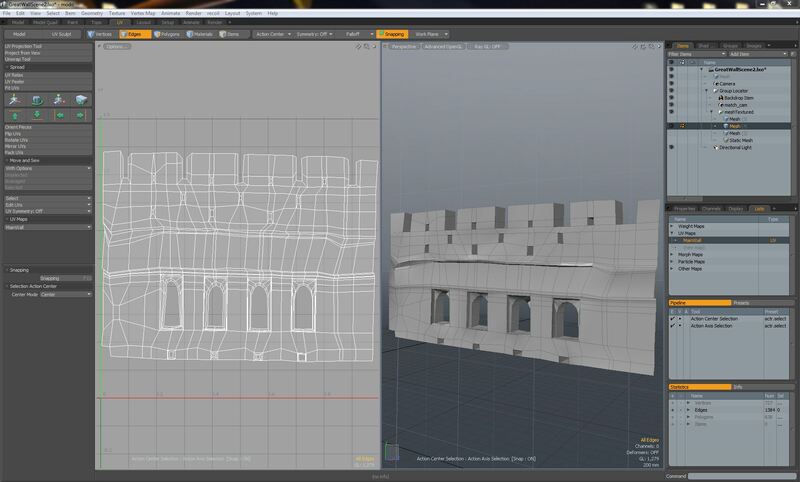 Once completed you should have a solid UV map of your object. Go to the Paint tab. Select your object and hit “M” on the keyboard to create a material for that object. 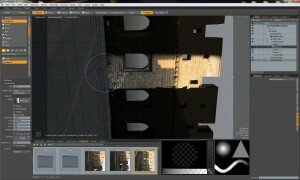 In the Shader Tree tab add in a texture by going to Add Layer > Image Map > (new image). Name your texture and save it as a jpeg or png. 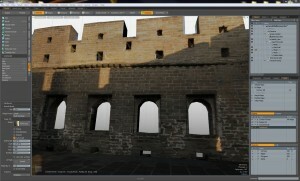 In the New Still window, change the format to RGB and set your resolution, then select OK. Select Paintbrush in the left toolbar, and highlight Image Inks in that same toolbar. Find the image that corresponds to your animation timeline in the Image Inks tab and select it. 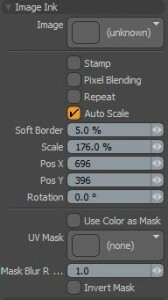 Right-Click in the viewport to adjust your brush size. Then click and drag on the geometry to paint onto the surface. If you encounter an error, ensure that you are painting on the correct image and UV map, double check you have the correct texture and object selected, then go to the Properties tab > Texture Locater > UV Map, be sure you have the correct UV map selected. Sometimes a little light tweaking of the image ink may be necessary to line up certain parts of the geometry that may not have been perfect in the solve. 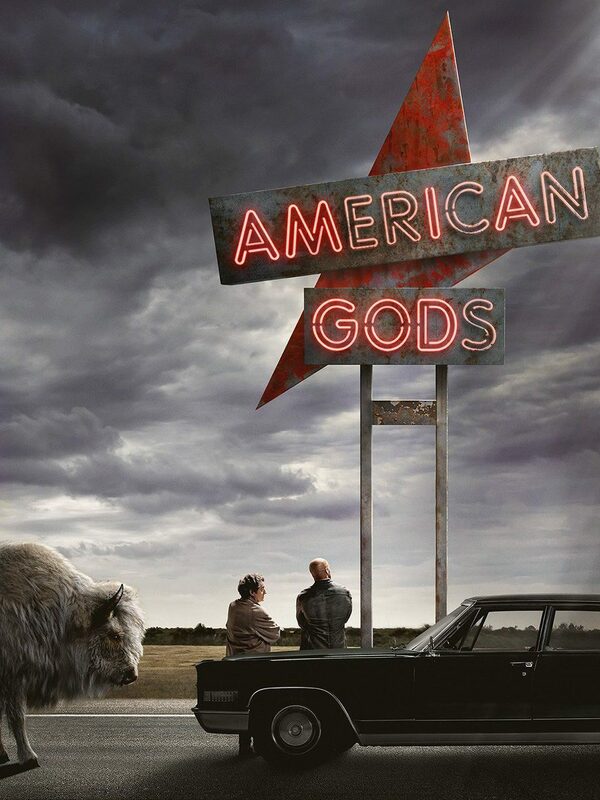 This can be done with the handles on the image in the viewport or with the menu structure on the left. By painting directly on the surface you have an immediate response to what is being painted. The more you paint the closer you will get to a finished product. Some geometry may still need to be tweaked to fit the images, as solves can be thrown off slightly by lighting changes in photographs. Refer to the Modo-Export documentation on methods for export. You may have different needs scene to scene, review your options and determine the best fit.